“K-pop Festival in Incheon 2014” will be held on the sidelines of the Incheon Asian Games that will open in mid-September, organizers said Thursday. The Visit Korea Committee said the event aims to promote Korean culture through K-pop, which has been an international sensation for about a decade. Celebrating its third anniversary, the upcoming event is also to promote Incheon’s various tourist attractions and unique charms as the host of the 17th Asian Games. “We will prepare the event to make Incheon an iconic city of Hallyu,” committee official Katie Han said. In a move to highlight the regional sports festival Asiad, the committee plans to invite mainly Asian nationals to the K-pop function, unlike its past invitation of people from various countries. 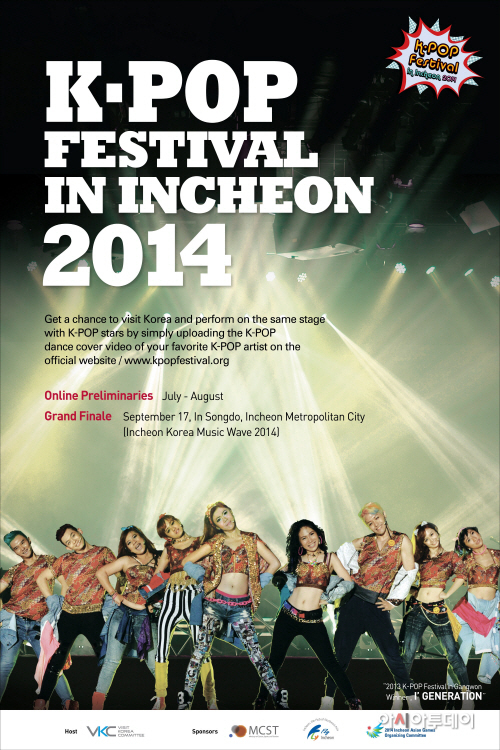 Those K-pop fans in Korea who wish to take part in the “K-pop Festival,” can join the cover-dance competition at the official website (http://www.kpopfestival.org) to win a ticket to tour Incheon for six days and five nights. Moreover, selected winners of the contest will have the chance to perform with popular K-pop singers on Sept. 17 at Incheon Korean Music Wave. The concert is slated for the end of Asian Games. “Since the upcoming K-pop festival is to be held to commemorate the Incheon Asian Games, I wish to see the passion and talent of fans from Asia, the base camp for Hallyu,” Han added.